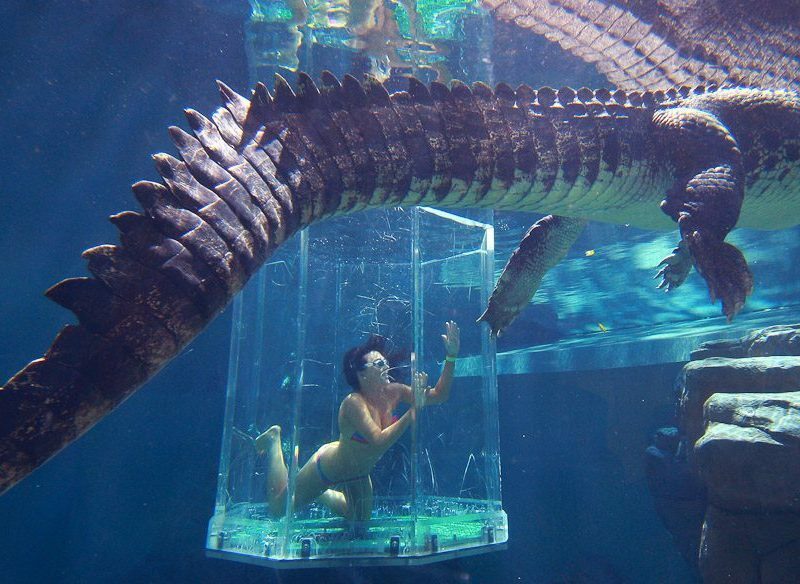 Pamela Wright takes a dip with a movie star, Burt the crocodile, in Darwin’s Cage of Death. Darwin lays claim to more crocodiles than any other city in the world, and many of them are at Crocosaurus Cove in the city centre. The three-storey venue occupies an entire block and offers the chance to see crocs from three months to 80 years old. There are other reptiles here too – goannas, lizards, geckos, turtles, frogs, rare pythons and venomous snakes. Next door, metre-long barramundi gorge on tidbits offered by professional divers during daily feedings in a 200,000 litre aquarium. At the Fishing for Crocs pool, there are so many juveniles vying for food it becomes a moshpit. Each one claws past his scaly brethren to gain prime pouncing position below a stick hooked with bloody meat. “Thank heavens for the reinforced plastic walls and the fact that they’re only young ’uns!” says an excited onlooker. The croc keeper stirs up the rowdy ones with his bare hands – on closer inspection riddled with scars. But, we were assured, Crocosaurus Cove has a perfect safety record. The venue also gives thrillseekers the chance to get up close to a croc in the water. In Australia’s only crocodile dive experience, a large acrylic cage, carrying up to two swimmers, is lowered from an overhead monorail into any of four separate crocodile enclosures for a 15-minute dive encounter with the likes of Chopper. At 80, he’s the oldest and largest reptile here, weighing in at 790kg. Now missing both front feet, which he lost in fights, he was rescued from the wild by a nearby cattle station, having refused many opportunities to behave. The dive involves getting in a 3m transparent tank, filled with water but with enough air at the top for breathing when lowered into the pool. A small group of spectators gather to watch two adventurers (my son and I), clad only in bathing costumes, poise for entry into the croc pools. We’ve heard the safety briefing and signed the indemnity release forms. “Knock on the cage walls to attract his attention,” recommends the park warden as he assists us into the heavily scratched cage. We’re dipped into the water, where a big old croc doesn’t seem much interested in us. After hammering away on the cage wall for a while to stir up the lazy dinosaur, we go above water for an overdue breath. Little do we know, the big fella likes the look of dangling feet, and heads on over. When we go back under we are greeted by this huge bugger rubbing his belly on the cage right in front of our eyes. His name is Burt, he’s 5.1m long and a mere 700kg, but saltwater crocodiles have the strongest bite force of any animal on earth, by far – up to 1700kg. Burt starred in Crocodile Dundee with Paul Hogan, and is described as “the movie star with attitude and a reputation with the ladies”. Finally coming face-to-snout with Burt reminds me of the song from Peter Pan: Never smile at a crocodile/No, you can’t get friendly with a crocodile… But when Burt bares his man-eating teeth, he scares the living daylights out of us, so we nervously grin back. Where 58 Mitchell Street in Darwin’s city centre. Notes General entry costs $35/adult, $23/child under 16. Family passes are available. Fifteen minutes in the Cage of Death costs $170 per person or $130 each for two people. The price includes general entry to all attractions such as the world’s largest display of Australian reptiles, fishing for juvenile crocs, holding a baby crocodile, twice-daily feeding and a bite-force exhibit. Cage minimum age is 15 years. Children 15-17 must be accompanied by an adult 18 years or older. Open daily (except for Christmas Day) from 9am until 6pm.